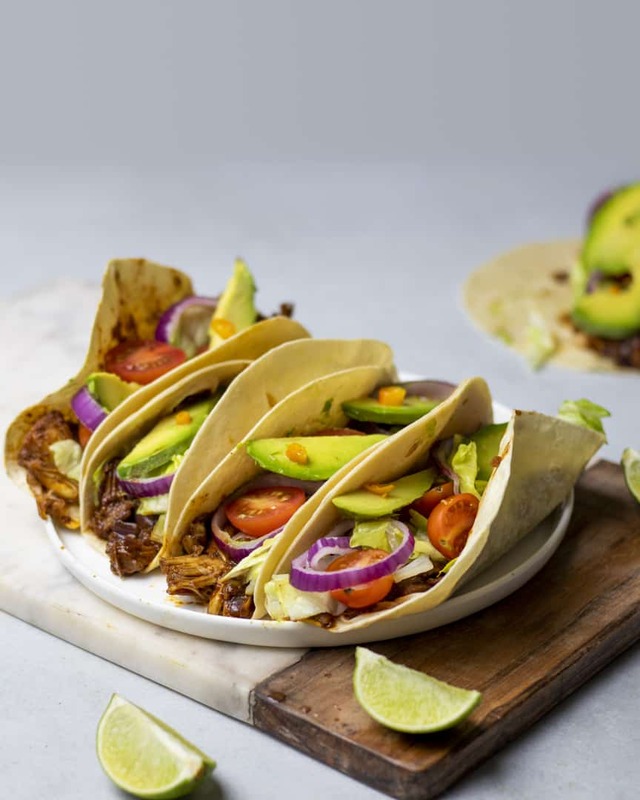 Our vegan jackfruit tacos are perfect for those days when you just want to devour something quick, easy and tasty. This recipe uses one of our favourite ingredients in the kitchen: jackfruit! Jackfruit is perfect for cooking with its sweet taste and ability to take on almost any flavour. The vegan jackfruit tacos mix is so easy to make in advance and store in the fridge to meal prep your lunches or dinners for the week. Not only does this intensify the flavour of the jackfruit but it also makes it super easy to make a tasty lunch for the next few days! 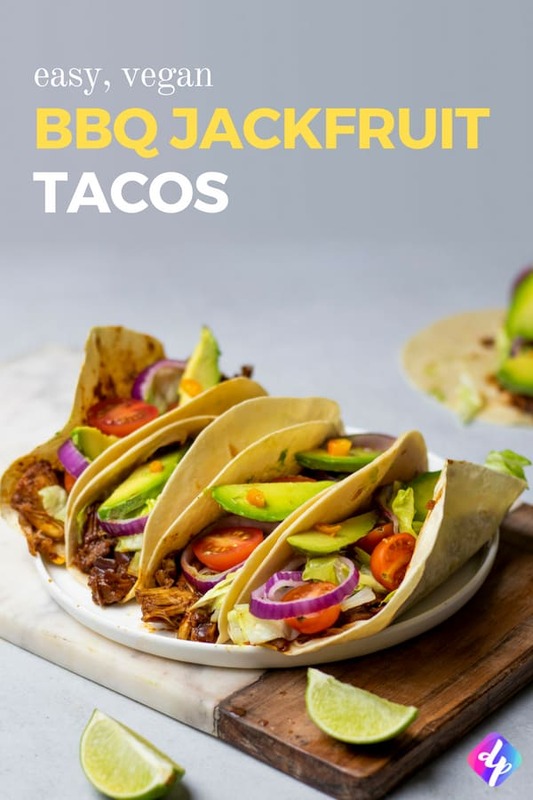 All you have to do is make your tacos, add the jackfruit and your preferred toppings and you have a healthy vegan meal that is ready in 5 minutes. Where can I get jackfruit? We buy our jackfruit at a nearby Asian supermarket, Yat Sang. If you don’t have an Asian supermarket or store that stocks jackfruit near you, Amazon also has the jackfruit we use in stock. Just make sure you buy jackfruit in brine, not syrup, as jackfruit in syrup is very sweet and won’t work for this recipe. 4 tablespoons BBQ sauce make sure it's vegan! Drain the jackfruit tins and set aside. Cut off the hard tip of the jackfruit and discard. Heat up the oil in a medium pan and sauté the red onion until it becomes clear and lightly brown (10 - 15 minutes). Then add the garlic and fry for another 2 - 3 minutes. Mix in the cumin, paprika, coriander, cinnamon, cloves and chilli powder and fry for another minute. Then mix in the tomato paste. In a separate bowl, mix together the jackfruit, soy sauce, BBQ sauce and apple cider vinegar until the jackfruit is evenly covered with all of the ingredients. Add the jackfruit mixture to the pan, season with pepper and simmer for another 15 minutes. While it is simmering, use two forks to separate most of the strands of the jackfruit. After 15 minutes, remove the pan from the heat and allow the jackfruit to cool before assembling your tacos. Mix together the diced tomatoes and white onion. Season with lime juice, salt and pepper and set aside. Once the jackfruit has cooled, spoon it into the prepared tacos (I use soft tortilla wraps, put them over my oven's wire tray in a taco shape and bake for 5 minutes on 180°C or 350 F). Add your lettuce, prepared salsa, avocado and other toppings and enjoy! Want to try making your own veggie burgers? Why not give our easy falafel burger recipe a try? Previous Post: « Easy Vegan Mushroom Meatballs Recipe!